This course requires Flash and therefore does not support the iPad. Click Here to buy the iPad supported version of this course. 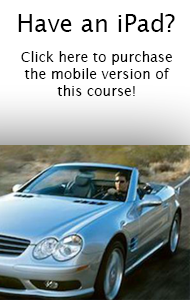 Are you looking for a defensive driving program that is rich in content, but does not take all day to complete? This condensed online defensive driving program is designed for individuals and corporations who need and want content that can make a difference in a short 2 – 3 hour program. Written and narrated by Dr. Randy Flemmer, President of Fleet Safety International, this program is insightful and provides numerous defensive driving tips and hints that can start reducing collision rates immediately.